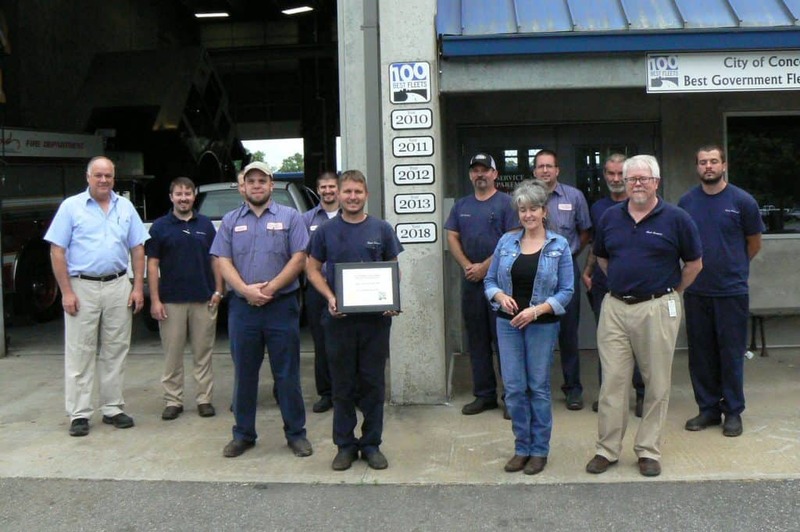 Members of the City of Concord Fleet Services Department hold their 100 Best Fleets award for 2018. Photo contributed by City of Concord Fleet Services Department. Seven fleets from North Carolina made it on the 100 Best Fleets in the Americas’ list of winners for 2018 — and in the next several weeks, Fuel What Matters will be featuring each fleet and what it has done to achieve success. This week, Daniel Nuckolls, Director of Fleet Services since 2002, talks about the City of Concord Fleet Services Department. This was the fifth year Concord has placed in the 100 Best Fleets. Nuckolls said Concord’s fleet has become more efficient through the years by implementing a career development program, rightsizing vehicles, and using alternative fuels and technologies. Concord began implementing more fuel-efficient strategies and equipment in 2003. Electric cars and EV chargers are used throughout the city, and today, about 5 percent of Concord’s light-duty fleet is comprised of hybrid electric vehicles. In the police fleet, Concord moved from 9-cylinder cars to 6-cylinders, which Nuckolls estimates saves about 34K gallons of fuel per year. Concord also uses B20 blend biodiesel for all diesel vehicles, which he estimated displaces 60,000 gallons of diesel fuel annually. “Fuel usage over the last 10 years has not increased very much at all — it remains flat,” Nuckolls said. The City Of Concord is an active participant in the Clean Cities coalition and is a core stakeholder in the Centralina Clean Fuels Coalition, according to their website. Fleet Services also developed and administers the Concord Air Awareness Program, which educates and informs City employees about air quality issues. One of the most successful improvements of the City of Concord Fleet Services Department, Nuckolls said, is the Career Development Program, which is designed to reward and advance the careers of technicians, parts personnel, and supervisors by converting their training and experience into ASE Certifications (Automotive Service Excellence). The Career Development Program was implemented in 2003 when the fleet had a total of 3 ASE certifications among 8 technicians, 2 supervisors, and 2 parts personnel. Now, the fleet has 84 ASE certifications with 6 Master Mechanic certifications. Nuckolls said the program has led the fleet to become the lowest cost fleet in North Carolina for five consecutive years.